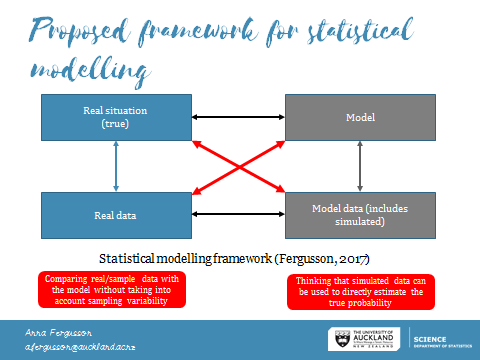 This post provides the notes and resources for a workshop I ran for the Auckland Mathematical Association (AMA) on using data and simulation to teach probability modelling (specifically AS91585/AS91586). This post also includes notes about a workshop I ran for the AMA Statistics Teachers’ Day 2016 about my research into this area. The workshop began by looking at three different questions from the AS91585 2015 paper. What was similar about all three questions was that they involved data, however, how this data was used with a probability model was different for each question. 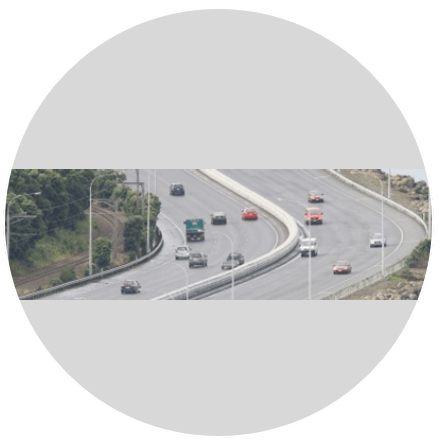 For the first question (A), we have data on a particular shipment of cars: we know the proportion of cars with petrol cap on left-hand side of the car and the percentage of cars that are silver. We are then told that one of the cars is selected at random, which means that we do not need to go beyond this data to solve the problem. In this situation, the “truth” is the same as the “model”. Therefore, we are finding the probability. For the second question (B), we have data on 10 cars getting petrol: we know the proportion of cars with petrol caps on the left-hand side of the car. However, we are asked to go beyond this data and generalise about all cars in NZ, in terms of their likelihood of having petrol caps on the left-hand side of the cars. This requires developing a model for the situation. In this situation, the “truth” is not necessarily the same as the “model”, and we need to take into account the nature of the data (amount and representativeness) and consider assumptions for the model (the conditions, the model applies IF…..). Therefore, when we use this model we are finding an estimate for the probability. For the third question (C), we have data on 20 cars being sold: we know the proportion of cars that have 0 for the last digit of the odometer reading (six). What we don’t know is if observing six cars with odometer readings that end in 0 is unusual (and possibly indicative of something dodgy). This requires developing a model to test the observed data (proportion), basing this model on an assumption that the last digit of an odometer reading should just be explained by chance alone (equally likely for each digit). Therefore, when we use this model, we generate data from the model (through simulation) and use this simulated data to estimate the chance of observing 6 (or more) cars out of 20 with odometer readings that end in 0. If this “tail proportion” is small (less than 5%), we conclude that chance was not acting alone. At the end of 2016, I presented a workshop at the AMA Statistics Teachers’ Day based on my research into probability distribution modelling (AS91586). This 2016 workshop also went into more detail about the framework for statistical modelling I’m developing. The video for this workshop is available here on Census At School NZ. We have a clear learning progression for how “to make a call” when making comparisons, but how do we make a call about whether a probability distribution model is a good model? As we place a greater emphasis on the use of real data in our statistical investigations, we need to build on sampling variation ideas and use these within our teaching of probability in ways that allow for key concepts to be linked but not confused. Last year I undertook research into teachers’ knowledge of probability distribution modelling. At this workshop, I shared what I learned from this research, and also shared a new free online tool and activities I developed that allows students to informally test the fit of probability distribution models. In terms of the modelling tool, I developed a set of teaching notes early last year, which you can access in the Google drive below. This includes some videos I made demonstrating the tool in action 🙂 I also started developing a virtual world (stickland http://learning.statistics-is-awesome.org/stickland-modelling/) but this is still a work in progress. Once you have collected data on either the birds or the stick people, you can copy and paste it into the modelling tool. There will be more variables to collect data on in the future for a wider range of possible probability distributions (including situations where none is applicable). This post provides the notes for a workshop I ran recently for the Auckland Mathematical Association (AMA) on developing statistics lessons that will engage students and promote statistical thinking. The workshop involved looking at some examples of the peer-reviewed lesson plans available from STEW (STatistics Education Web https://www.amstat.org/education/stew/) and discussing how to adapt these to the New Zealand Curriculum. We also reviewed a well-designed statistical model eliciting activity in order to identify features of high quality statistics lessons. We didn’t quite get to apply these features to co-construct a new statistical modelling activity based around the question “Can you determine someone’s gender based on their writing?” but I will include some ideas for this in part two of this post. Designing effective statistics learning activities (including online tasks) requires the use of contexts and situations that will engage students. Great ideas for activities are all around us, and can vary in inception from interesting news articles we read to everyday events or conversations that surprise us. However, it is not just about having a great hook for learning task, we also need to pay attention to the statistical thinking we are promoting through the learning activity. How do you turn these awesome ideas into effective and meaningful lessons? It can be difficult if you are new to teaching statistics to be able to separate the good from the bad in terms of assessing how well other people’s resources allow for the building and integrating of both statistical and contextual knowledge. Often we are motivated by time pressures and ease of use when we select teaching resources. Ideally teaching resources that are shared would include notes to help other teachers about the kinds of questions to ask students, possible misconceptions, the kinds of things we want to see students doing and how to help students with misunderstandings. These notes of course take time to write up……. hence why I have not shared very much yet on this site! Fortunately, there are places where you can find really good teaching resources which you can use to inform and guide your teaching. You can then use these well-designed lessons as the basis for your own activity, modifying and adjusting where necessary to meet the needs of your students. It’s easier to do this when the resources explain the thinking for teachers and for students, so you can see which aspects of the activity are “non-negotiable” and which aspects can be changed. However, you should be prepared to do some thinking yourself – I haven’t yet found a teaching resource that I can use in the classroom exactly how it is when I’ve found it. I see this as a positive thing though (having to think! ), because through critically reviewing resources I have developed a greater confidence for teaching statistics. In particular, I have learned a lot from the lessons plans developed and shared by others through Census at School (NZ) and through workshops or conferences. For example, these resources developed by Joanne Woodward were written a number of years ago, and while there may be some areas of the curriculum where the focus has changed, the teacher instructions that accompany the student worksheets still contain excellent advice (particularly in terms of structure and teaching strategies). These resources are so good, you’ll find some lessons on STEW that are based on her lesson plans (e.g. Bear hugs). Let’s STEW on this …. Another great place to find teaching resources is STEW (Statistics Education Web). This is site set-up and maintained by the American Statistical Association (ASA) and each lesson plan is peer-reviewed by an editorial board. You’ll find similar planning templates are used for each of the lessons and a huge variety of contexts and ideas covered across the plans. These lesson plans are based on the US curriculum/standards so there are some differences in content and approaches, and the levels used may not match exactly to NZ curriculum levels or NCEA achievement standards. For example, this lesson plan about text messaging covers great ideas about bivariate data and fitting linear regression models, but unlike what we do in NZ, extends the statistical knowledge covered into sample-to-population inference for the regression coefficients and the correlation coefficient, which is not required for AS91581. This lesson about M&Ms is pretty much good to go and focuses on developing understanding of sampling variability for proportions. The lesson could be extended to lead towards ideas of margin of error for AS91584 and also the use of bootstrapping to construct confidence intervals. How random is the iPod’s shuffle? Read the lesson plan and materials supplied – better yet, try the lesson out with other teachers! Ask yourself: What are the main phases to activity? What does the teacher and the student need to be doing and thinking? Ask yourself: What is or is not appropriate for the desired curriculum level? How could the lesson be adapted? The activity begins with a claim that songs are not randomly generated using this Shuffle function. Students are given a set of 25 randomly generated playlists for students to use as a basis to describe characteristics of a random sample, in this case, a randomly generated playlist. After students come up with their ideas of what characteristics to look for, they are given a set of five additional playlists (also randomly generated) on which to test their rules. Once they feel confident that their rules can be used to determine if a set of songs have NOT been randomly generated, they are then given three disputed playlists, which students are asked to judge based on their rules. Students work in groups to examine the data, come up with rules, and finally, write a report about their finding and whether or not they believe the three disputed playlists were not randomly generated.